Advantech, AMD and Mentor, a Siemens business, are partnering to make Artificial Intelligence (AI) technology more accessible and easier to implement, which is expected to create more AI-based business opportunities. AI technology will, they say, take embedded systems to the next level with higher efficiency and smarter systems designed to improve people’s lives. For instance, up to 4% of the 300 million diagnostic radiology images that are captured annually in the US contain errors. AI-infused image recognition using Machine Learning can see far more detail in MRI and X-ray images than human eyes, so it can improve diagnostic accuracy and help prioritise treatment. AI technology in embedded system is often integrated in service model innovation rather than the manufactured product and it is highly sophisticated in the numerous tasks it performs including data collection, data analysis, pre-trained models, and inference. In terms of machine learning, programmed algorithms rely on powerful and reliable computing units for big data consumption. That’s why edge computing plays an important medium to satisfy the connection between the cloud and sensor devices. With the partnership of Advantech, AMD, and Mentor, they aim to help customers accelerate AI implementation by integrating each party’s products and services. We are each devoting resources to make edge computing easier to apply so customers can concentrate on AI application development for their hardware and middleware. Advantech offers an embedded platform (SOM-5871/AIMB-228) equipped with the latest AMD Ryzen Embedded V1000 processers, in combination with the Mentor Embedded Linux operating system. The AMD Ryzen Embedded V1000 processor supports frameworks, libraries, tools, and compilers for machine vison applications that leverage the full power of the Ryzen processor with Radeon Vega GPU technology. More importantly, the three companies embrace open standards such as OpenVX, OpenCL API supported on the Linux kernel, so users can migrate machine learning across diverse hardware architectures for a variety of AI applications. 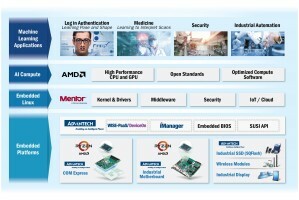 “Combining the power of the AMD Ryzen Embedded V1000 processor, machine vision software, and solutions from our partners Mentor and Advantech, we are helping customers realise a future where they can easily create and install applications enhanced by artificial intelligence into their embedded ecosystem,” adds Stephen Turnbull, director of product marketing, Embedded Solutions, AMD.